The first sign that Kim Jong-un was making his inaugural overseas trip as leader of North Korea was the appearance of an armoured train in China. His predecessors, father Kim Jong-il and grandfather Kim Il-sung, also preferred rail for their domestic and overseas travels. Kim Jong-un studied in Switzerland in the 1990s, including at the International School of Berne, along with his brother and sister, and is believed to have visited Germany and France during the period. Unconfirmed South Korean news reports said Mr Kim and his brother Jong Chol visited Tokyo Disneyland as children using fake passports to enter Japan in 1991. Infamously his eldest brother Jong Nam (below) - assassinated at Kuala Lumpur's international airport last year in a killing widely blamed on Pyongyang - tried to do the same in 2001, using a Dominican Republic passport, but was stopped at Japanese immigration. Kim Jong-un is known to travel by air domestically, and is said to have accompanied his father on a 2011 train trip to China, but is believed to have not previously left the North since ascending to power. In 2015, the Kremlin announced he would be attending ceremonies to mark the 70th anniversary of the Soviet Union's victory over Nazi Germany in World War II, but in the end the visit was cancelled with no reason given. 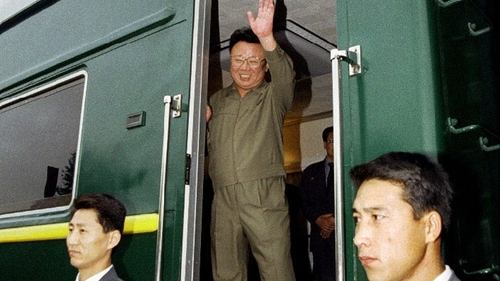 Mr Kim's father Kim Jong-il was renowned for his fear of flying, limiting his foreign trips to overland journeys to China and Russia by armoured train - the same mode of transport used to reach Beijing this week. His 2011 trip to China was a marathon 6,000km journey taking in Beijing, Nanjing and Shanghai among other destinations. Kim Jong-il also took trains to Russia in 2001, when he went to Moscow and met Vladimir Putin and 2011, when he met then-president Dmitry Medvedev in the Siberian city of Ulan-Ude. At the time, residents near the Bureya rail station were told to stay in their houses and not look out of their windows as his train arrived. Of the three Kims, the North's founding father Kim Il-sung was the most frequent overseas traveller. He secretly visited Moscow in 1949 to meet Joseph Stalin and seek support for his plan to reunify the divided Korean peninsula by force. The following year, his forces invaded the South, triggering the Korean War that pitted Pyongyang's Chinese- and Russian-backed troops against a US-led United Nations alliance. In 1961, Kim Il-sung returned to Moscow to meet then-General Secretary Nikita Khrushchev and the two countries signed a mutual defence pact. Kim Il-sung's longest train trip took place in 1984, on a tour of the Soviet Union and other East European countries - Poland (pictured above), East Germany, Czechoslovakia, Hungary, Yugoslavia, Bulgaria and Romania. The carriages the two elders Kims used for their travels are both on display in the Kumsusan mausoleum in Pyongyang where their bodies lie in state.